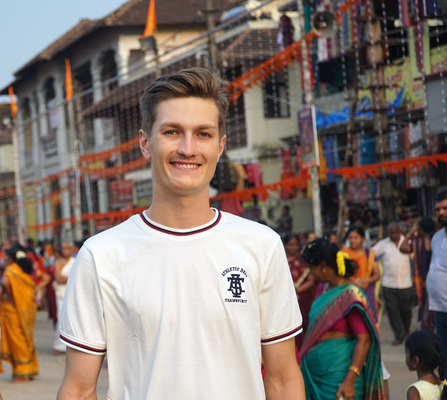 DESIGNING FUTURES: Deakin architecture student Ben McKenzie in India. Aspiring Geelong architects will this month present designs for future early learning centres in India after touring the country in January. Deakin University student Ben McKenzie joined 15 others on the trip, which inspired him to “think differently“. “The journey was a life-changing experience for me, showing me a whole new world of architecture and cultural diversity,” the waterfront campus student said. The students worked with local architects and mechanics to create seven designs for maternal care and early learning centres (Anganwadis) in the Indian city of Udupi. Senior lecturer Susan Ang led the trip as part of Deakin’s commitment to architectural expression and sustainable building in under-privileged communities. The students also held a workshop with local kids to gain exposure to their fundamental needs, ideals, characteristics and behaviours, Ms Ang said. The Indian Government was considering Mr McKenzie’s and his fellow students’ designs, and had indicated all seven could become real Anganwadis, Ms Ang said. Another cohort of students will travel to a different Indian city later this year through the lntercultural Dialogue through Design program (iDiDe). The iDiDe Anganwadi Exhibition 2018 runs untilo 26 July at Deakin’s Waterfront campus gallery.